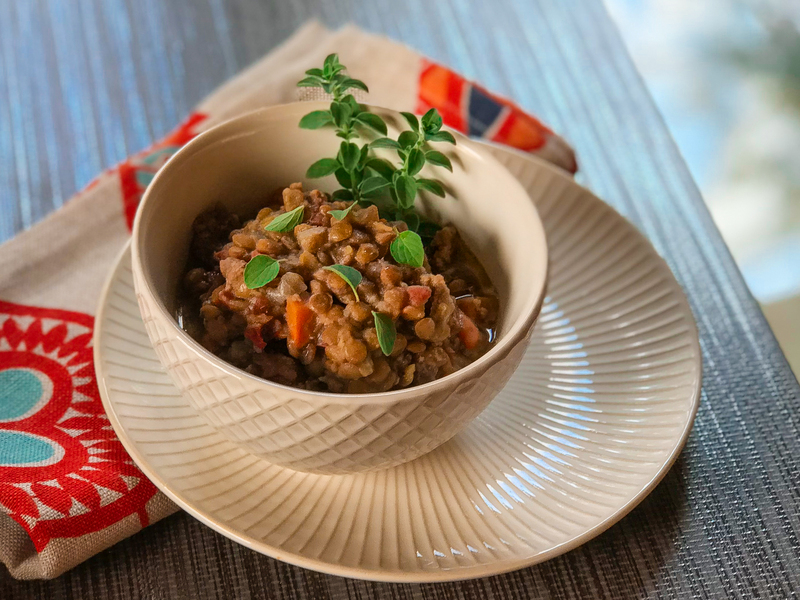 Lentils were the first thing I ever cooked in a pressure cooker, and they won me over to pressure cooking because they cook so much faster than on the stove or in the slow cooker, and with no laborious babysitting of the pot to make sure it doesn’t boil over or burn on the bottom. 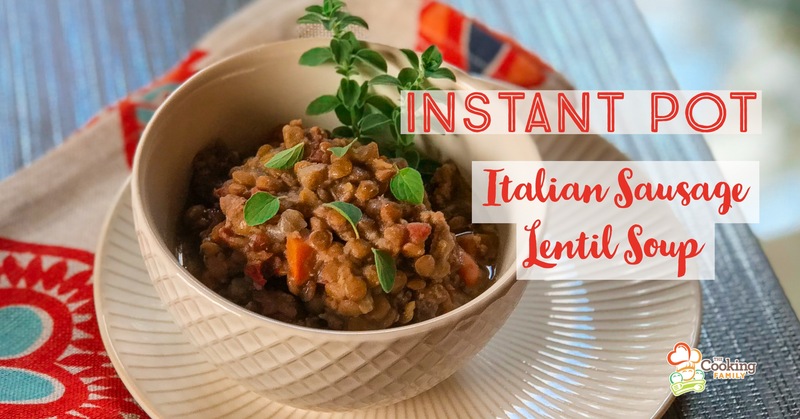 This soup comes together quickly and easily in the Instant Pot. We have also included instructions for slow cooker and stove top below. This is a great meal for the whole family to work on. Kids can do so much with this recipe. My nine-year-old son makes the chicken stock. 6 year-olds can fetch and open cans. Toddlers love to sort beans and lentils. With good training in knife skills, older children can dice the aromatics. 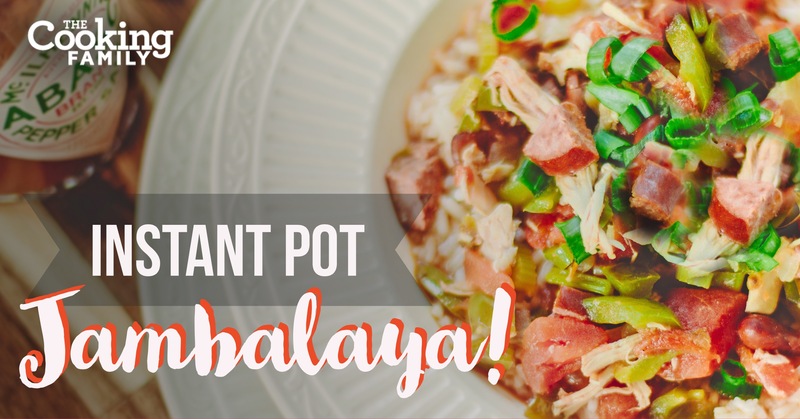 This recipe works well in the 6 quart Instant Pot and yields 9 hearty servings. We call it Throw & Go because you can literally throw all the ingredients in and walk away. Come back in about 30 minutes or so to release pressure and eat some yummy soup! Turn on Instant Pot to <Sauté> mode to begin heating everything while you throw all the ingredients in the pot. Cook on Soup setting/High pressure/15 min/10 min NR. Close lid of Instant Pot. Check valve and make sure it is on <Sealing>. Turn off Instant Pot if it’s still on Saute mode. Turn Instant Pot ON to <Soup> program. Adjust the time to 15 minutes at high pressure by pressing <+> or <-> on the front of your Instant Pot. Allow Pot to Natural release for at least 10 minutes. Stir well and taste. Add any needed salt and pepper to taste. A splash of Tabasco really hits the spot! In a large dutch oven or soup pot, brown Italian Sausage. Spoon off any unwanted fat. Reserve about 1 tablespoon of oil in the pot. Add aromatics: onion, celery, carrots, bell peppers. Sauté for 5-10 minutes, or until onion is clear, and carrots are tender. (Not mushy, but tender.) Add garlic, oregano, basil, and fennel and sauté for 1 minute. Add tomatoes and stir well while continuing to sauté mixture for about 2 more minutes. Stir in chicken stock and lentils. Simmer on stove for 25-30 minutes, or until lentils are cooked through. Add salt to taste. Brown Italian sausage in a skillet. Drain excess fat and place in slow cooker insert with all other ingredients. Cook on Low for 6-8 hours or high for 4-5 hours. Stir and taste. Add salt to taste. I really loved your instant pot pasta recipe so I thought I’d try this one too! One question, when I was putting in all the ingredients to my 6 qt, I noticed I was very close to the max line, even before I put all the broth in. Since lentils expand a little, is it ok to fill it all the way to the max? P.S. I love watching your videos… your kids are so adorable! Now I want to start my kids cooking young 🙂 there is so much they can do at a young age, and you can tell they are very informed about cooking. Love it! So glad you came back to try another recipe, Ariel! I hope you get your kids with you in the kitchen, too. It’s been such a blessing to me and it’s a blessing for the kids too. I hope you find lots of tips for doing that here, it’s part of our passion!